Big Boys Toys returns to Abu Dhabi National Exhibition Centre (ADNEC) from November 23-26, for the Middle East’s largest luxury, innovations and technology expo. Organised by Artaaj Events, the show will be opened by Sheikh Nahayan bin Mabarak Al Nahayan, Minister of Culture and Knowledge Development and will launch a number of world-firsts over the four days. 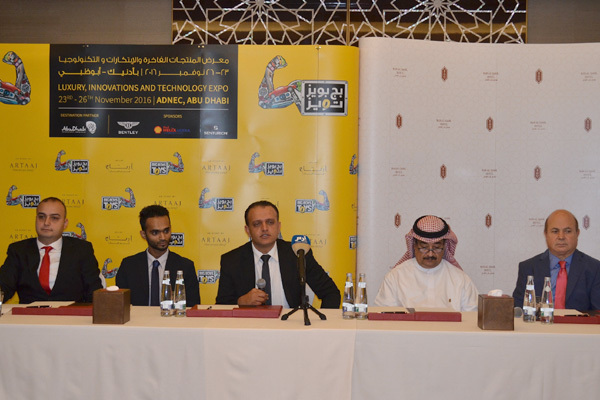 The press conference held on November 21 in Abu Dhabi's Bab Al Qasr Hotel announced that the exhibition this year will be three times larger than last year, the show will display over 200 products from various categories. Products on display include gadgets, automobiles, handbags and futuristic fashion accessories, offering men, women and children of all ages some of the most advanced products from around the globe. Visitors will be part of a host of headline product launches, including the world's fastest street legal production bike, one of the world’s most powerful cars boasting fighter jet technology for the first time in automobiles and the globe’s smallest and fastest single-engine jet. For the first time this year the expo will also feature an entire section dedicated to women who love luxury. The all-new Woman’s World exhibits the world’s most unique and exclusive in women’s luxury lifestyle, including travel, jewelry, beauty, lifestyle and wellness. For the thrill seekers, the Super Car Test Drive Pit presented by Shell Helix will provide the boldest visitors with the chance to drive some of the most powerful cars in the world. Visitors will also be able to enjoy interactive experiences, such as virtual reality, simulators, reality games and shooting. Big Boys Toys encompasses all facets of the luxury and lifestyle industry, including aviation, marine, drive and ride, wellness, fashion, lifestyle, digital, adventure and off-road industries. This year’s event will feature products exceeding a net worth of over $200 million.